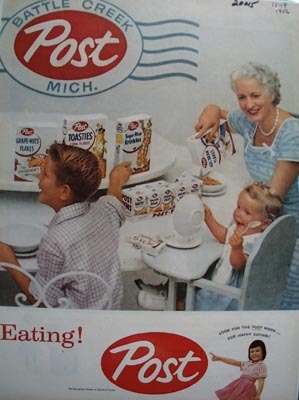 Post Happy Eating Ad 1956 This is a November 19, 1956 advertisement. It is a nice color two page ad from Post. of Battle Creek. Husband is kissing wife goodbye while the grandmother serves the children Post cereal. It reads, One good turn deserves another"" In mint condition. Photo is taken through plastic and may show wrinkles or crookedness that is not in the ad. This magazine tear sheet measures 10 1/2"" wide by 14"" tall. 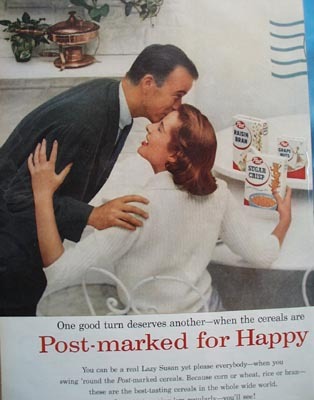 Items Similar To "Post Happy Eating Ad 1956"